So you have emergency flooding, and now you’re trying to figure out where to start with the cleanup and repairs. Step one: don’t panic. Whether water is creeping in the basement’s foundation or from an overflowing sump pump, most basements can be salvaged with proper flood remediation. Heavy rain storms pose a serious risk of emergency basement flooding. Southeast Michigan homes fall victim to water-related issues relatively often. Quickly and effectively addressing the problem can save you a lot of time and money. Before doing anything near the water, turn off the main breaker in the house. Even the smallest bit of water can cause shock and electrical fires. Once the power is off, carefully remove home goods from the area. If the basement is not completely flooded, save as much as you can before water destroys it. Throw away materials too far damaged from water. Everything else needs to be properly dried out to prevent the growth of mold spores. 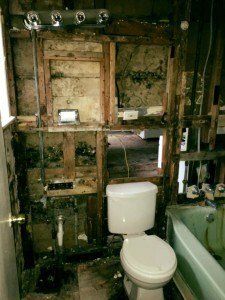 If the water is deep, however, it’s best to leave the room as is and call an emergency contractor so they can help ensure the project is handled properly. Depending on where the water is coming from, it could be contaminated. Rain and floodwater are known to carry pathogens, which are harmful microorganisms. This can be dangerous to your health and cannot be seen by the naked eye. Until the area has been cleared of risk, keep children and pets away from the wet room. Sump pumps are used to protect your basement from a rising water table outside the home’s foundation. Electrical sump pumps can fail if the power goes out. Alternatively, overworked sump pumps or aged plumping can cause home flooding. If your sump pump is defective, getting a new one can resolve your problem. If the system is being overworked, you may need to wait until the heavy rain ends. Aged or damaged sewage systems can add to this problem and add unnecessary stress to your sump pump. A home’s foundation protects it from the group water. Unfortunately, basement foundations can crack, bow and shift. This damage to foundations welcomes water through hydrostatic pressure. This can become a recurring problem in homes with small water damage occurring often. Don’t ignore small cracks or water seepage as they appear. A shifting home can lead to other problems in the future and often requires professional inspection and repairs. Foundation repairs and waterproofing can protect against future flooding problems. Many basements have footing drains, which are underground pipes designed to draw water away from your home’s foundation. If you have a drain or cleanout cap on your basement’s floor, check if there’s a blockage. Footing drains require regular cleanouts. To unclog a footing drain, you may be able to use a garden hose. If the clog is too serious, a sewer snake may be necessary. Remove sticks, dirt and other debris from your gutter system. Something this simple is very important to prevent basement flooding. Also check the downspouts; they need proper drainage and should be lead water away from basement walls. Large puddles near the house’s foundation can cause a host of problems. This is possibly the worst kind of basement flooding and often the costliest. Sewer backups can be caused by materials, such as roots, clogging the sewage piping or can be a result of sewers overflowing during the storm. Heavy rains add stress to plumbing systems. Older homes and infrastructure are especially prone to sewage backup problems. If the problem is a result of issues in the city’s sewer systems, repairs may need to wait until rain has stopped. The overflow may be caused by an overfull sewer system that may resolve once a heavy storm finishes. While it may be the city’s responsibility clear a backup, if that’s the cause, the flood damage to your home may be your responsibility. Check with your insurance and city regulations to understand if your damage is covered. A drain line and sewer piping between your home and the street are often the homeowner’s responsibility to maintain. If a blockage is within this area, snaking or replacing the piping may be necessary. Once you’ve identified what caused the home water damage, determine if it’s something you can repair yourself. If the water damage is not extensive, getting a dehumidifier, turning up the heat, running fans and opening the windows can be effective solutions for interior water. If there were water puddles or excessive leaking, long-term damage may have occurred. 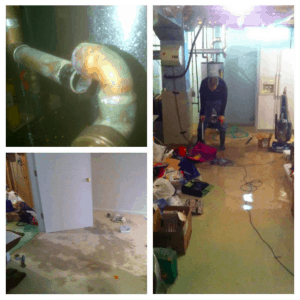 Flooded basement often require professional water cleanup. Keep in mind that just because the water is gone, that doesn’t necessarily mean the problem has been fixed. Unresolved issues in your home’s structure can lead to continuous basement flooding and expensive damage. Hiring the right professional can safeguard your home from unseen water damage. Some emergency basement flooding is simply to difficult to repair yourself. Water can seep into your home very quickly and needs to be dried and ventilated properly. Carefully select a professional that has the right experience for your project. Dampness can turn in to mold, causing health issues and extensive home damage. Carefully discuss the project’s details with your home contractor. Ask them about the longevity of their work, experience in water remediation and necessary maintenance. The wet spring is approaching and will cause basement flooding in many Michigan homes. If you haven’t actively worked to prevent home flooding, check out our blog: 5 Tips to Prevent Basement Flooding. Need water damage repairs?